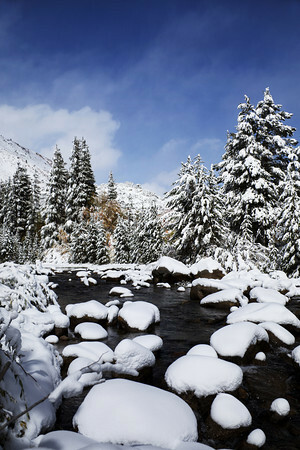 The first Fall snow storm of 2011 rolled through the Eastern Sierra. It snowed all Tuesday night and into Wednesday morning. After breakfast at Cardinal Village, the storm finally broke so I went up to North Lake to capture the moment. The wind was blowing hard at first and made my first few images difficult to record. This image was made at the small creek that flows out of North Lake. Fresh snow and soft clouds add to this crisp scene.